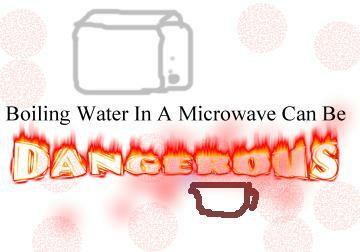 Boiling Water in Microwave Can Be Dangerous! I got this email from a friend a few days back about the dangers of using Microwave for heating water and liquids. For something that we practically do at least 8-10 times a day, I was shocked at how harmful it could be, if not done in the right way! Here is a story about a person who got serious burns trying to brew coffee in a microwave. I'm not sure about the origins of this tale, but it does sound scary, and a little research showed me that this can indeed happen to anyone who is not careful while using a microwave to heat liquids. While it is not a common occurrence, you should definitely be informed about it so you can prevent an accident at home. It boils down to simple science, and is not hard to digest; its just the fact that we all are so habituated to doing things a certain way, that something like this shakes us out of our comfort zone! I for one, have learnt a lesson, and I hope you too; please use caution while heating liquids in a microwave, and inform your kids about it too! A 26-year old decided to have a cup of coffee. He took a cup of water and put it in the microwave to heat it up (something that he had done numerous times before). I am not sure how long he set the timer for, but he told me he wanted to bring the water to a boil. When the timer shut the oven off, he removed the cup from the oven. As he looked into the cup, he noted that the water was not boiling, but instantly the water in the cup 'blew up' into his face. The cup remained intact until he threw it out of his hand but all the water had flown out into his face due to the build up of energy. His whole face is blistered and he has 1st and 2nd degree burns to his face, which may leave scarring. He also may have lost partial sight in his left eye. While at the hospital, the doctor who was attending to him stated that this is fairly common occurrence and water (alone) should never be heated in a microwave oven. If water is heated in this manner, something should be placed in the cup to diffuse the energy such as: a wooden stir stick, tea bag, etc. It is however a much safer choice to boil the water in a teakettle. "The e-mail that you received is correct. Microwaved water and other liquids do not always bubble when they reach the boiling point. They can actually get superheated and not bubble at all. The superheated liquid will bubble up out of the cup when it is moved or when something like a spoon or tea bag is put into it. To prevent this from happening and causing injury, do not heat any liquid for more than two minutes per cup. After heating, let the cup stand in the microwave for thirty seconds before moving it or adding anything into it." There is actually some truth to this. It is caused by a phenomenon known as Super Heating, which is common for a microwave. It can occur anytime water is heated and will particularly occur if the vessel that the water is heated in is new. What happens is that the water heats faster than the vapor bubbles can form. If the cup is very new then it is unlikely to have small surface scratches inside it that provide a place for the bubbles to form. As the bubbles cannot form and release some of the heat that has built up, the liquid does not boil, and the liquid continues to heat up well past its boiling point. . What then usually happens is that the liquid is bumped or jarred, which is just enough of a shock to cause the bubbles to rapidly form and expel the hot liquid. The rapid formation of bubbles is also why a carbonated beverage spews when opened after having been shaken. Take care if you use a microwave to heat water. In some cases, boiling water can explode causing serious burns to your face and hands. Do not use excessive amounts of time to heat water, check the water frequently and absolutely never look closely at the cup to determine how hot your water is. Mixing other materials in the water before it is heated, such as instant coffee or sugar, also reduce the risk. If you are still not convinced, read more about How to Boil Water in a Microwave; Be Informed, and Stay Safe! As they say, Prevention is better than Cure! Thanks for the post manasi. I better be careful before heating something next time. thanks for the reminder...also when the liquid gets superheated, chances of one burning ones tongue is also there...since most of the time u dont realize how hot it has become!! take care..
Oh, I've received this forward too. Ya, it can be dangerous. Thanks, Mansi. Have a great vacation! thanks folks! yeah, it's never too late to prevent an accident! on a diff note, thanks for all the wishes! we are having fun, and have one more vacation week ahead! :) will be back with you all soon though! happy feasting, and happy blogging! I read about it a long time ago-quite a scary things. Always good to remind ourselves of safety pointers.